Hacker Pschorr branded lederhosen printed t-shirt. 100% pure "ultra" cotton (pre-shrunk) Gildan White T-shirt. Medallion coin hat pin features the Hofbräuhaus HB crown logo. Great for a German hat, lapel or tie tack! Diameter: approx. 1"
Hofbrauhaus HB Women's Dirndl short sleeve t-shirt size small. The world famous Hofbrauhaus is one of Munich's oldest breweries. It was founded in 1589 and has since been one of Munich's most popular tourist attractions. 3.5" wide Party Button suitable for Oktoberfest or Germanfest reading "KISS ME I'M GERMAN" with a Bavarian blue & white diamond flag pattern background. Width: 3.5"
After over 200 years of celebrating good food and good beer, Germany's Oktoberfest has been firmly established as one of the world’s largest annual festivals. Oktoberfest, or Octoberfest, is a 16-day celebration that draws approximately 6 million people from all over the world, who come to enjoy the singing, dancing, eating, and, of course, the beer. Oktoberfest's history begins with the wedding of Crown Prince Ludwig (later Ludwig I) to Princess Therese of Saxe-Hildburghausen on Oct. 12, 1810. The citizens of Munich were invited to attend the festivities. This was unusual at the time, as nobles rarely associated with the public. Horse races were held at the closing of the event, which were repeated the following year. The celebration continued annually, eventually becoming larger and more elaborate, to its present-day state. Oktoberfest's association with beer stems from its Bavarian roots. Bavarians are considered to be some of the world’s most beer-loving people. Although beer was consumed at the early Oktoberfest celebrations, the event was initially built around a horse race and, later, a state agricultural show. As the number of beer and foods stands increased, so did the significance that was placed on the beer. In 1896, the first giant beer tent was erected. Today, there are 14 large tents and 20 small tents. Almost half of all German breweries are in Bavaria. More than 6 million liters (roughly 1.75 million gallons) of that beer is consumed each year at the festival in Munich. This accounts for about 30% of the entire annual beer production of all of the Munich breweries combined. 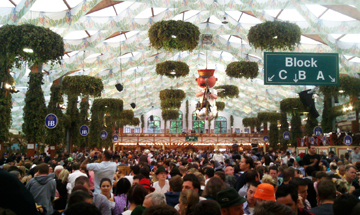 There are only six breweries in Munich who are able to serve the Oktoberfest beer in the festival tents. 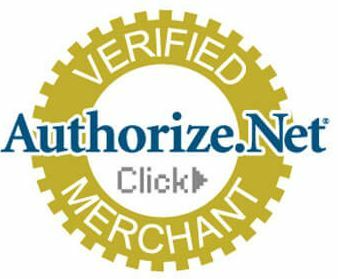 These breweries, which call themselves the Club of Munich Brewers, conform to the "Reinheitsgebot," or Bavarian purity requirements. They must also brew the beer within the city limits of Munich. At Munich's Oktoberfest, the beer steins used are typically made from heavy glass and usually have a decorative brewery logo on the side. The steins are often sought out as souvenirs. Beautiful, hand-painted beer steins depicting scenes such as a traditional beer wagon being unloaded at an Oktoberfest celebration are also memorable souvenirs of this rich and colorful festival. Since 1872, Oktoberfest has begun on a Saturday in September. It usually lasts for about 16 days. Traditionally, the festival ends on the first Sunday of October, unless it is the first or second day of the month, in which case Oktoberfest continues until October 3. 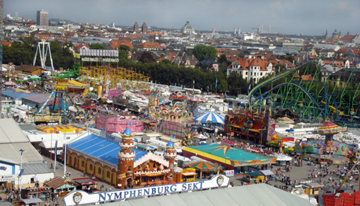 Oktoberfest is also enjoyed in one form or another in many cities and towns worldwide. Several festivals are held in which attendees enjoy traditional German food and music, and raise their beer steins in celebration of this annual event.